Charlotte Northeast figured out how to make a rollicking entertainment of Thomas Heywood’s ungainly 1631 intrigue -filled comedy, “The Fair Maid of the West.” She parodies Heywood’s work as she goes, keeping everything in high theatrical style as she highlights Heywood’s absurd plot meanderings, emphasizes the extremes of late Jacobean (actually Carolingian) theater, gives her characters broad sway, and allows romance and occasional acts of honor to flourish amid a tale of treachery, piracy, prejudice, and plain bad reporting of the facts, e.g. who has and hasn’t died..
Northeast is especially well-abetted by Philadelphia Artists’ Collection co-founding artistic director Dan Hodge, who takes the usually threatening role of Roughman, one of the most cantankerous louts in maritime England, surrounding islands, and the Barbary Coast, and turns it into a master class on how to control a comically sprawling performance yet be as expansive as Siberia, as flamboyant as Ru Paul, as bombastically funny as W.C. Fields, as crude as a Pinter punk, and as swashbuckling as Errol Flynn, only after one of his notorious drunks, not in his role as a hero. Northeast’s art is in letting Heywood’s convoluted story come through, blessedly in a compact form instead of the two parts the author designed, while giving her cast and its audience a good time via their unbridled but pertinent clowning. Almost everything is done with an antic attitude and the intention to make you laugh as you share the characters’ dramatic adventures. Northeast and company come up with lots of ideas and lots of ways to simultaneously ridicule and do credit to Heywood. You realize early you are not going to see a cogent story designed to generate suspense and wring your heart. A light, silly, commentating tone is established from the start, and you stay on it for the creative ride, content to be entertained while seeing some of the reason plays written between the Elizabethan and Restoration periods are rarely produced (although I’ve seen some and know others that are worthy of being acted). PAC’s “The Fair Maid of the West” shows little respect for its model, which is perfectly justifiable. Northeast seems keenly aware that Heywood supplies a messy hodgepodge that could only find light of day as a curio, or as an exercise for reader’s theater. Her adaptation does pay heed to the basic plot and themes Heywood advances. Bess Bridges emerges as a laudable heroine. Master Spencer, though an adventurer and one who hotheadedly kills a man in Bess’s defense, remains a gentleman of admirable quality. Captain Goodlack retains his character as a snake who hides behind a handsome coat and fine manners. In general, Northeast gives her actors free rein. Hodge’s Roughman, a nefarious bully who would use gender to dominate Bess and brutal, conscienceless force to intimidate all others, takes his evil more from the style of Snidely Whiplash than from Bill Sykes or other thoroughly predatory villains he presages. Hodge is more likely to foster laughs than fear. Northeast doesn’t aim for texture or strong emotion. Her production is a shrewdly achieved deconstruction that constantly delighted this critic who generally regards the mention of “deconstruction” the way American blacks regard the “n” word. It would be impossible to give an unedited, undoctored “The Fair Maid of the West” a serious production. The tedium would drive audiences to distraction. The style would stupefy. Heywood’s excesses would cause unintentional laughter, so it’s best in the long run that Northeast and PAC went full tilt for comedy and did it with such droll and exuberant results. “The Fair Maid of the West” begins on the shore of Plymouth, an English coastal town from which sailors and others are embarking to sea to fight the attacking Spanish Armada. (“The Fair Maid of the West” was published in 1631. It is believed to be written as much as three decades earlier, which would be James’s time.) Bess Bridges is a barmaid at one of the more popular taverns serving the rude, often vulgar, crowd passing through Plymouth. Barmaids are not known for their chastity. Their tips, and the profits of the pubs in which they work, often depend on them being a bit bawdy and flirtatious. Bess is a straight arrow, but she knows her business and uses her widely reputed beauty and talent for badinage to lure customers to her tavern. She has the good spirit and cunning commercial sense to let men tease her or touch her shoulder. She’ll spar verbally with the best of them and wink an eye or twitch a hip when the mood strikes her, but her playfulness is limited to attracting and keeping up custom of her establishment. Bess is a virgin who belies what people think about barmaids and other working women. She’ll let a man go so far, then remove his hands from where they are unwanted and, if fun escalates to familiarity, even show her mettle at martial arts. Bess knows how to keep her establishment lively while drawing her beer and serving whiskey. She’s not a prude. But she won’t be trifled with, and she won’t be bedded. Spirited hijinks have their limits, and Bess will let a man know when he has crossed the line from amusing to irritating. Some don’t take the hint well. Two travelers to Plymouth think they can have their way with Bess, that she owes them unrestricted pleasure or that she’s putting on airs by rejecting them after having been the partner to hundreds. They, even more than Roughman, press their case. Bess is in danger of being raped. Luckily gentlemen also stop in Plymouth. Master Spencer, a cultivated man of wealth, is accompanying his friend, Captain Goodlack to Plymouth and to his commission on one of the ships defending Britain against the Armada. He is not one for a fight or intrigue, but when he sees Bess, a damsel in distress, he does the correct melodramatic thing and demands her attackers to cease. They cease, but only to attack Spencer. In fighting the marauders, he kills one. Northeast sets up a nice comic bit of pathos by having the slain fellow’s companion have a confused, “Look what you’ve done” attitude towards his friend’s skewering. All of a sudden, everyone, Bess and Spencer in particular, are nervous about the law. Mind you there’s been so sign of the law or any authority in Plymouth. Only scalawags and rogues amid an occasional fun-loving or benign sailor and some military officers. Almost all of them have made a rude suggestion to Bess or some other woman. Spencer and Goodlack represent the only folks who can claim genuine respectability. Except, of course, for the noble, self-abnegating Bess who sees the man she may be able to love in the hero of her most recent close shave, Spencer. He, as happens in plays, shares her feelings and, class differences aside, intends to marry Bess. He later confides to Goodlack that he has named Bess the heiress to his fortunes. That is, as long as her chastity is tested and verified. If she proves a poseuse and a willing slattern, Spencer instructs Goodlack to forfeit Bess’s claim and nominate himself to inherit his wealth. You can correctly guess where this last gambit leads. But I get ahead of Heywood, and Northeast. Fearing prosecution, Bess and Spencer leave Plymouth and go to Foy, a Cornwall town in which Spencer has property. He puts Bess in charge of a tavern he owns there, He and Goodlack meanwhile sail off in a convoy they believe in headed to Spain to combat the Armada. It is at this juncture that Spencer tells Goodlack, who is suspicious of Bess’s honesty, about his will. Northeast meanwhile has begun an amusing routine of having one or another character remove cards from a shelf in front of a map to help us keep track of all the places Heywood’s plot will eventually take us. The bit is done so charmingly, it frequently gets a laugh. Neither Bess nor Spencer find peace. Bess, who has brought some of her close friends and fellow barmaids to Foy, is beset by the constant attention of Roughman, who seems unable to accept no for an answer no matter how blatantly, insultingly, or injuriously he’s rebuffed. Roughman, after all, is convinced of his appeal and of the tactics that make him irresistible in love and war. As played by Hodge, he is an inveterate fighter who will challenge a rival with little provocation or set traps for adversaries to increase his advantage in a duel. He is a relentless wooer who doesn’t grant Bess a minute’s respite in his campaign to be her partner in life and in the profits from Spencer’s bar, which he co-opts at one point. He, in keeping with comic tone, can also be an errant coward who will flee when he thinks he might be bested in a fight and who will try to appease any adversary he believes could vanquish him. Hodge is hilarious in his boomerangs from braggadocious initiator of conflict or confident romancer to sniveling refugee from danger and continually rejected Romeo. Of course, no calamity or retreat is ever Roughman’s fault. He was either beset by legions and had to flee to save his life or claim the lady, Bess, is too haughty and is using feigned resistance to further excite his lust. As “Fair Maid” proceeds, Spencer mistakenly boards a Spanish galleon as is taken prisoner. When he cunningly escapes, he lands in the Azores where he seems to have been mortally wounded in a fight. Goodlack is informed that Spencer has succumbed to his wounds and an accompanying fever and that his friend has been buried. Matters take an odd turn. Bess, confronting Roughman dressed as man, forcing one of his retreats, and regaling the coward and all Foy with his fear and flight, wins the rascal’s respect and friendship. (Northeast also includes a sequence where while crossing a field, he is frightened by a sheep, with whom he deals roundly. The sheep, a cardboard cut-out with a perplexed expression, is a gem of a prop.) Goodlack, who Bess thinks is her friend, returns, but his mind is set on provide her false and pouncing on the chance to claim Spencer’s money. Bess passes all test and wins his regards as well. With Spencer allegedly dead, and Bess taming her various nemeses, Heywood has to find something for his characters to do, especially when he begins “The Fair Maid of the West’s” second part. First, she lands in Morocco, where, in a divergence from Heywood’s plot — Hey, why not? One inanity is as good as another, right? — Bess, admired for her beauty and good nature everywhere she goes, comes to the attention of the Moroccan king, Mullisheg, played to classical perfection with sly comic touches by the always impressive Brandon Pierce. Mullisheg is a lady’s man, and he hankers for Bess to be not only his concubine but his queen. He is so smitten, he is willing to lop off heads and imprison any rival who thinks he has a prior or more earnest claim to our heroine. The living Spencer also finds his way to Morocco. Confusion is cleared. Escapes from imprisonment and battles are accomplished. Comedy lives up to its name, and the dozen or so loose ends of “Fair Maid” come to a fine end. Rarely are you emotionally involved in any of the details of Northeast’s production. Emotions and intensit be dashed. Melodrama tomorrow. Comedy tonight. 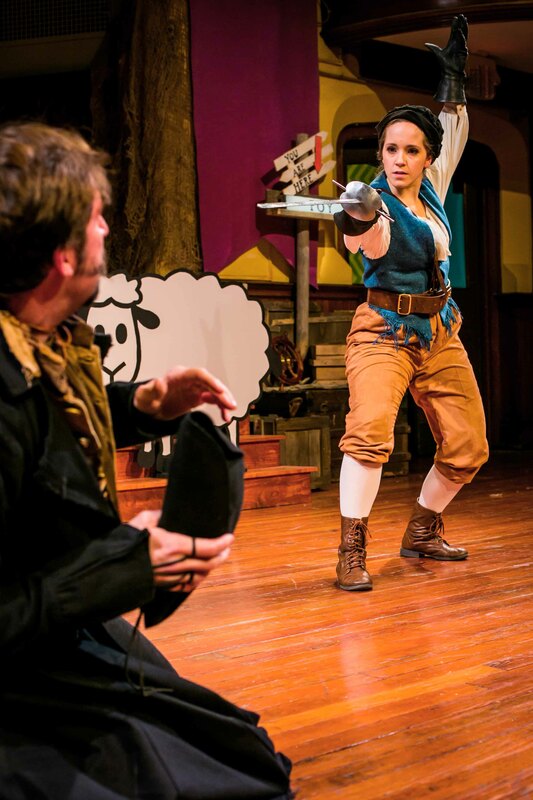 PAC’s “The Fair Maid of the West” is an exhilarating romp from start to finish. It never takes itself or Heywood seriously, and it doesn’t ask you to either. Going into all of the sources of comedy and giddy gambits would take all day. Just to choose an example, swordfights can be comic, with opponents only dodging the other’s blade in fearful, purposeless defense, or fierce and breathtaking (another warning for those who would opt to sit on the floor cushions). Bess can bat eyes and be as boisterous as the most raucous of her patrons, but Rachel Camp also shows Bess’s modest, honest qualities, including her sharp common sense. Two clowns, played by Robert DaPonte and Eric Scotolati, assay several characters ranging from ruffians to cringing lackeys and go through an array of hijinks. Hodge is simply irrepressible, thank goodness. Throughout her production, Northeast neglects no opportunity for a joke or laugh, and “The Fair Maid of the West” will keep you amply amused. Even a gag of someone raising a pirate’s eye patch to reveal a perfectly clear and healthy eye works as if was fresh. Northeast’s entire cast deserves kudos, but the stickouts are Hodge, Adam Altman as Spencer, Chris Fluck as Goodlack, and Pierce. Hodge’s gifts have been well-chronicled. In addition to giving Roughman various facets, all comic and all largely drawn, Hodge exemplifies the freedom Northeast’s production has to be spontaneous and theatrical. He seems unbound by convention. He can veer from Heywood to comment in character, and he can engineer stage business just for the fun of it. The fourth wall is no limit. If Hodge wants to commune with the audience, he does so, whether it involves scowling at a punter in Roughman’s rage or enlisting a volunteer. Hodge’s ease in his role shows the comfort he has on stage and his and Northeast’s intention to make “Fair Maid” and inclusive production and let the audience in on everything, especially the internal jokes. Through any nonsense, Adam Altman always maintains Master Spencer’s nobility. He takes the stance of a true hero, able to recognize a woman’s virtues in spite of her social station and ready to thwart any rival or adversary to plagues him, whether as a pest to Bess or a enemy that seeks to hold him captive. Altman, like Pierce, gives his performance a classical tone. His is the one character who is rarely funny. His Spencer is more involved in expressing his affection and care for Bess, or in escaping from some legitimate calamity, to be humorous. The same is true for Fluck’s Goodlack. He is serious in two ways. He is the least likely character to partake of the pleasures each harbor affords. He is earnest about his service in the Spanish wars and in his devotion to Spencer. He is also intent on proving Bess to be less chaste than she claims, as he has distinct designs on inheriting Spencer’s estate. Goodlack is a villain that is eventually reformed and redeemed, and Fluck gives him proper stature, the right measure of villainy when warranted, and sincerity when he realizes the multiple errors of his ways. Brandon Pierce, so commanding in “Dutch Masters” for Azuka and so plaintively real as a young man with honest ambition in “Milk Like Sugar” for Simpatico, has a defining breakthrough when he gets past playing a slew of wild scoundrels Northeast assigns him to being a positively regal and well-spoken Mullisheg. In that role, Pierce gives Northeast’s production its lone touch of conventional classic majesty. His line readings are crisp and articulate. His posture exudes importance and pride that should not be mocked without expecting dire consequences. “Fair Maid” actually acquires texture when Pierce dominates its scenes. His performances makes you want to see Pierce in more challenging roles. This impressive young actor becomes more impressive yet. Rachel Camp is lively and pertly comic as Bess. She can also exhibit the character’s tougher, more self-preserving side as when Bess fools Roughman into thinking he has encountered an angry, argumentative man as he crosses a field he eventually flees in fear of being killed. Camp sort of lives up to her last name in the sense of stressing Bess’s comic side. She, more than Altman or Fluck, exemplifies the parodic nature of Northeast’s staging. Eric Scotolati and Robert DaPonte go through an entire catalogue of bits, fast takes, physical comedy, and sleight of hand (and costume) as they play everything from rambunctious youths that spur Spencer to action to Marty Feldman-like prison guards and meek servants. Jennifer MacMillan is solid in a series of roles that center on authority figures or sensible companions to Bess. KC MacMillan plays Bess’s faithful but clumsy friend and employee, Clem, one who speaks her mind, more because of not having much of a filter than from being an astute observer or commentator. Except for the last dress Bess wears, which has a gathered skirt used as a sash that clashes with the rest of her outfit, Katherine Fritz has obvious fun dressing “Fair Maid’s” characters and finding appointments for its set. Matt Sharp’s lighting enhances the production’s fun. Michael Cosenza choreographed some excited fights and staged others for good comic effect. “The Fair Maid of the West” runs through Saturday, April 18, produced by Philadelphia Artists’ Collective at Broad Street Ministry, 315 S. Broad Street, in Philadelphia. Showtimes are 8 p.m. Thursday through Saturday. An additional show is scheduled for 8 p.m. Monday, April 13. Tickets are $20 and can be obtained by calling 215-551-1543, by e-mailing pacboxoffice@gmail.com, or by visiting www.philartistscollective.org. This entry was posted on April 13, 2015 by nzoren in Theater Reviews and tagged Adam Altman, Brandon Pierce, Broad Street Ministry, Charlotte Northeast, Chris Fluck, Classic, Dan Hodge, Eric Scotolati, Jacobean Comedy, Jennifer MacMillan, KC MacMillan, Parody, Philadelphia Artists Collective, Philadelphia Theater, Rachel Camp, Robert DaPonte, Slapstick, The Fair Maid of the West, Thomas Heywood.